Small and economical. 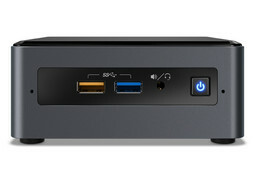 Intel NUC Mini PC’s are known for their compact design. The new NUC generation maintains this concept, with Intel equipping them with a set of new processors too. In this review, we will be covering the NUC Kit NUC7CJYH, an entry-level NUC Mini PC that is equipped with an Intel Celeron J4005 processor. Find out in this review whether this Gemini Lake processor is up to scratch in an entry-level NUC Kit. NUC is Intel’s Mini PC range. Intel sells these in either kit form or as fully working machines. Hardware choices vary from the basic up to enthusiast level, the latter of which includes an Intel Core i7-8890G processor. Our test device is the Intel NUC Kit NUC7CJYH, which is powered by an entry-level Intel Celeron J4005 processor. The J4005 is a 14 nm desktop CPU that is based on Intel’s Gemini Lake architecture. The J4005 is a 10 W dual-core CPU with a 2.0 GHz base clock speed that can increase up to 2.7 GHz when required and has a 4 MB cache. The J4005 includes the Intel UHD Graphics 600, an integrated GPU that has 12 execution units (EUs). The NUC7CJYH comes with a 65 W power supply, a VESA mount and documentation about the Mini PC. It is worth bearing in mind that the Kit doesn’t include an OS, RAM or internal storage. 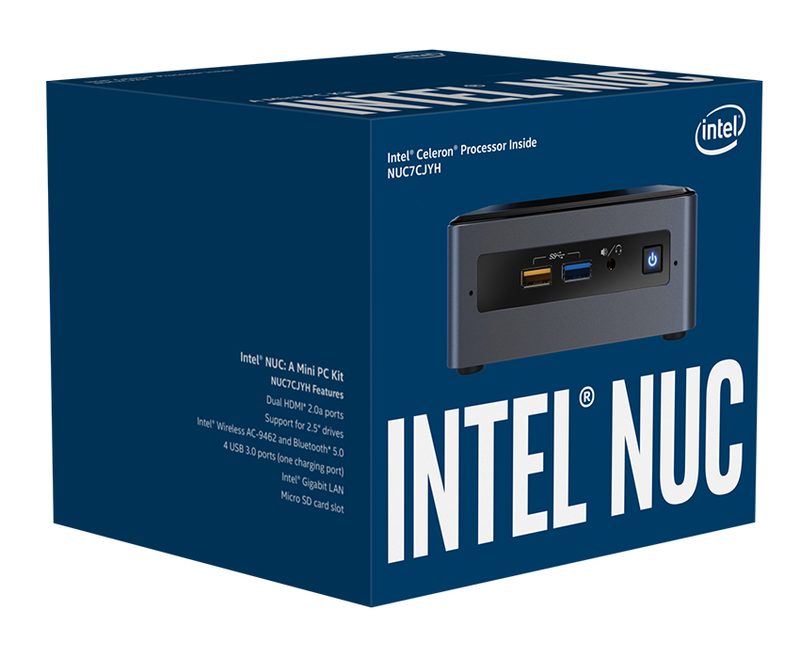 If you need a bit more power then there is the NUC7PJYH, a Kit that includes an Intel Pentium J5005 processor. The J5005 is a 10 W quad-core Gemini Lake CPU that clocks between 1.5 GHz and 2.8 GHz. The NUC7PJYH lacks an OS, RAM and internal storage too though. If this doesn’t appeal, then Intel offers numerous NUC Mini PCs with similar specifications but with the components that the NUC7CJYH omits. Intel currently offers the NUC7CJYSAL, which adds Windows 10, 4 GB DDR4-2400 SO-DIMM RAM and a 32 GB eMMC drive. , DDR4-2400 1.2V SO-DIMM. Maximum of 32 GB RAM with two DIMMs. The case is dominated by plastic and metal. The combination of materials helps make the NUC7CJYH look quality and gives it a robust and solid feel. The top has a glossy finish that quickly picks up fingerprints and micro scratches. The bottom plate is secured with four small screws. Unscrewing these allows the bottom plate to pop off and gives access to the internal components. 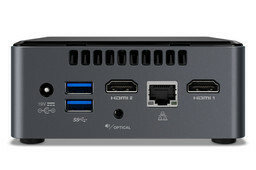 Intel included a VESA mount in the box, which allows the NUC7CJYH to be mounted to a monitor or on a wall. The ports are distributed across three sides, with Intel placing most on the rear of the device. Overall, there are four USB 3.0 Type-A ports and two HDMI ports. The front of the device has two USB ports, a 3.5 mm headphone & microphone jack and a power button. On the back, there are the two remaining USB ports, two HDMI ports, an RJ45 Ethernet port, an optical audio connector and a power connector. There is also an SD card reader and a lock slot on the left-hand side. It would have been nice had Intel included a USB Type-C port, with this saved for more expensive NUC variants. Our test device weighs 577 g, with the power supply weighing an additional 330 g.
The NUC7CJYH is powerful enough for simple office applications thanks to its entry-level processor and weak integrated GPU. 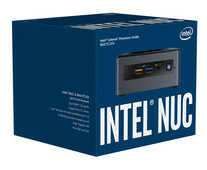 The NUC7CJYH is powered by an Intel Celeron J4005, a 10 W dual-core processor with 4 MB cache. The CPU has a 2.0 GHz base clock speed that can increase up to 2.8 GHz when required. There is no Hyper-Threading support though so there are only two threads that run in parallel. The limiting factor performance wise is the 10 W TDP, which both the CPU and GPU share. So, while the CPU will run at 2.6 GHz in CPU-only stress tests, it drops to 2.4 GHz when running CPU and GPU stress tests simultaneously. Single-core performance has improved on previous Celeron generations, but buyers should still not expect anything great from the Celeron J4005. The CPU didn’t thermal throttle during our Cinebench R15 multi-loop benchmark test thanks to the NUC7CJYH’s decent cooling system. Our test device performed consistently during the Cinebench R15 loop, averaging 144 points in the multi-core test and 77 points in the single-core test. The benchmarks indicate that the Celeron J4005 has more than 30% better single-core performance than older Pentium and Celeron chips, but 13% worse multi-core performance than the Intel Pentium N4200. Regardless of the test, the Celeron J4005 is significantly behind its Intel Core ix counterparts. Naturally, the hardware chosen to make the NUC7CJYH into a working machine will affect system performance. A conventional HDD will cause the system to run slower than it would if an SSD was installed instead. This is the case for RAM too. More RAM will benefit system performance up to a point depending on what applications that are running. Light users probably won’t notice the difference between 8 GB and 16 GB RAM, whereas heavier users may do. Moreover, using two matching RAM modules will enable dual-channel mode, which offers a slight performance boost over single-channel mode. We equipped our test device with 8 GB DDR4-2400 RAM and a SanDisk SSD. The NUC7CJYH only has a 2.5-inch drive bay. An M.2-2280 slot would have allowed for faster SATA and NVMe SSDs to be installed, which would have further improved system performance. The results in PCMark benchmarks are like the results from CPU benchmarks. The Celeron J4005 is easily faster than the Pentium N4200 but cannot keep pace with the significant Core ix CPUs. Overall, the NUC7CJYH is powerful enough for simple office applications. The CPU quickly reaches its limits with several applications in the foreground though, leading to noticeable slowdowns. The same principle applies to opening too many browser tabs, which quickly bogs down the system. We would suggest thinking carefully about whether the NUC7CJYH is the right Mini PC for you if you need to run multiple applications and several browsers tabs simultaneously. We equipped our test device with a SanDisk Ultra II 240 GB SSD, model number X41100RL. The NUC7CJYH only has a 2.5-inch drive bay, but this should be sufficient in most use cases. We would recommend using an SSD over a traditional HDD for better performance. The SanDisk Ultra II achieved good transfer speeds in our tests, demonstrating that the NUC7CJYH has decent hardware. Treat our test here as a rough guide though as results will vary with different storage devices. The Intel UHD Graphics 600 handles graphics. The integrated GPU has 12 EUs and a clock speed of between 250 MHz and 700 MHz. Graphics performance depends on CPU load and the amount of RAM installed. Performance is comparable to the Intel HD Graphics 500, making the UHD Graphics 600 suitable for only the simplest of requirements. Positively, the updated video decoder can hardware decode and encode H.265, HEVC, and VP9 videos. It is worth noting that we could not get Netflix to play in 4K, but we could get YouTube to play in maximum resolution at 3840x2160 at 60 FPS. The Intel UHD Graphics 600 in the NUC7CJYH will struggle to run many games. It has no real gaming capabilities but can easily play simple browser-based games. Our test device manages its temperatures well. 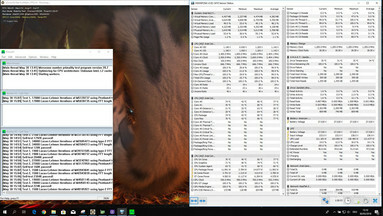 Surface temperatures heat up only slightly under load, while the fan helps to keep the CPU cool enough so that it does not thermal throttle under load. We measured a maximum core temperature of 80 °C under load during stress testing, demonstrating how effective the cooling system is. Likewise, our test device had no problems during our FurMark and Prime95 stress tests, averaging 2.4 GHz throughout. Our test device experienced no 3D performance issues in 3DMark 11 after our stress tests. Overall, fan noise is relatively restrained. While the fan speed remains low during stress tests, it remains audible at idle. As such, the NUC7CJYH does not run silently and there is no way to manually adjust fan speeds. Fortunately, our test device exhibited no coil whine during our tests. The NUC7CJYH is a power-efficient device that fully exploits its CPU potential. Our test device consumes 0.8 W on standby, which increases to a maximum of 8.4 W at idle. Typically, the NUC7CJYH consumes approximately 4.5 W at idle, with a minimum consumption of 3.9 W. This increases to between 12.3 W and 21.4 W under load, which is enough headroom for the Celeron J4005 to be fully exploited. Overall, if you are looking for a power-efficient Mini PC, then you should take a closer look at the NUC7CJYH. The Intel NUC Kit NUC7CJYH in review. Test device courtesy of Intel Germany. The Intel NUC7CJYH is a compact and economical Mini PC kit that is an attractive proposition for office work thanks to its low price. The NUC7CJYH is equipped with a basic Intel Celeron J4005 dual-core processor and an Intel UHD Graphics 600 integrated GPU. It is worth keeping in mind the device’s intended purpose though. The affordable price is tempting, but this comes at the expense of an OS, RAM and internal storage. These will be necessary additional costs that are worth factoring in when considering the NUC7CJYH. Performance is suitable for only simple office applications and Internet browsing. The NUC7CJYH can even decode and encode 2160 p videos thanks to its Intel UHD Graphics 600. The NUC7CJYH wouldn’t be the right choice if you want to play games or run graphics-intensive tasks. Overall, the NUC Kit NUC7CJYH has impressive system performance considering its power consumption and compact design.